Recently the former key engineers of Alfresco Activiti have announced their resignation from Alfresco. They forked Activiti and started their own project. Though the success of that project remains to be seen (and personally, I wish them all the best), one thing is clear: The talent that has exited the company has left a gaping hole and brings the future direction of the platform into question. Though there are still many developers at Alfresco, we suspect that the Activiti project in two years won’t bear much resemblance to the current Activiti project. This has to be a significant concern to many existing users/customers. Since we forked Activiti ourselves 3.5 years ago, many users have migrated from Activiti to Camunda, and they haven’t looked back. For those who still use Activiti, I would like to point out 5 good reasons to consider such a migration now. Although we have dramatically improved the technology since we forked Activiti, the core concepts remained the same, and the migration path to Camunda is very straight-forward – it’s basically a matter of minutes. My co-founder Bernd Rücker has written a step-by-step blog post about it. There is scientific evidence that the Camunda BPMN engine performs better. Besides BPMN, Camunda supports CMMN (case management) and DMN (decision automation), in both enterprise and the community edition. Camunda comes not only with an engine, but also with very powerful tools for modeling, task management, operations monitoring and user management, all of them open source. There is a lot more to mention, but I want to keep this brief. Our tech lead Daniel Meyer has written a blog post about the details. During the last 3.5 years more than 20 Camunda core developers as well as many, many external contributors have worked together on the open source codebase of Camunda. 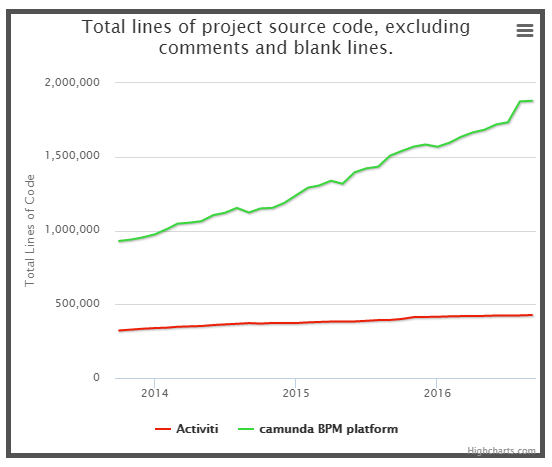 When you compare Camunda to Activiti on OpenHub, this becomes very obvious, for example when comparing the lines of code of the projects (see graph). Before we forked Activiti, we had already established a profitable BPM focused consulting business. We also had significant visibility in the BPM market, partly thanks to our best-selling book Real-Life BPMN. This allowed us to quickly build a sustainable, rapidly growing product business with a subscription model (i.e., recurring revenue model) for an enterprise version of Camunda BPM. Today we are serving more than 100 customers, among them AT&T, T-Mobile and Universal Music (click to see more customers). Our annual churn rate (i.e, customers that terminate the subscription) is below 1%, and by end of Q3-2016, we had a year over year revenue growth of 86%. Geographically, we are still headquartered in Berlin where the majority of our 50+ headcount is based. However, we incorporated a subsidiary in San Francisco in 2014 and more recently opened an office in Denver, CO which allows us to serve the North American market even better. Our partner network spans over 20 countries, as well as our customer base. We have achieved these results within the last 3.5 years and did not take up external funding. Camunda is still run by the owners and owned by the founders which brings us to the last point. Between ECM and BPM, there is a small amount of overlap. But not more. Some of our customers use workflow automation for routing documents, but most don’t. Also, the real challenges in BPM technology are not about „low-code“ which is a misunderstanding of those software vendors that are driven by IT research firm opinions and short-term shareholder expectations but rather, a profound understanding of user requirements. Unfortunately, you will not come to that degree of understanding, if you’re not sufficiently focused on BPM. When Bernd and I started the company in 2008, we focused on BPM from day one, because BPM is our passion. Over the years, we hired extraordinary people who share this passion and extend it into areas we would not have imagined. Those people allowed us to start new open source projects such as bpmn.io (which will soon lead to our first SaaS offering), and those people are currently working on an entirely new generation of workflow technology that will make BPMN execution available in a way that you would not consider possible. In order to attract and keep that kind of talent, a company needs to have a clear and consistent idea about the kind of problems they want to solve, and why that matters. This however will still not ensure that the most talented people will come and stay with you, but without that, you can be sure they won’t. I did recently try it on at the community version and it rocks. It is a very powerful BPM tool, solid engine, nice a useful modeler, and also comes with interesting administrative tools. I am very excited to try this amazing tool on my future projects. Just thinking on serious works.